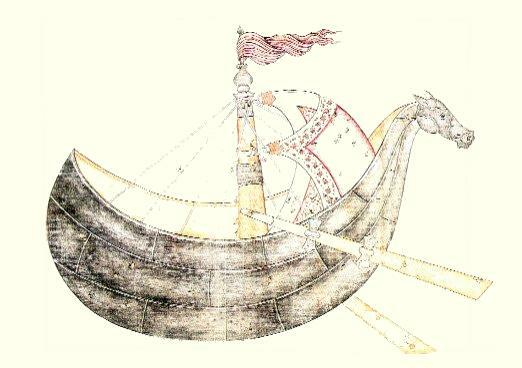 About the name, "Argo Navis"
Greek legend has it that Jason, in his quest for the Golden Fleece, commissioned a ship to be built that was named Argo Navis - the Swift One. The bow of the vessel included a mighty beam which was fashioned from Zeus' oak tree and which enabled the ship to speak and thus guide its crew. Jason assembled a crew of heroes, the 'Argonauts', many of whose names are now immortalized in the stars, including Hercules, Castor and Pollux. When the voyage was over, the Goddess Athene placed the boat in the heavens. The ancient astronomer Ptolemy described in his work, the Almagest, the Argo Navis as being one of the 48 constellations then recognized by the ancient Greeks. In 1763 the French cartographer De Lacaille divided the constellation of Argo Navis into three smaller constellations, Carina the Keel, Puppis the Stern, and Vela the Sail. Canopus, the second brightest star in the night sky and once also known as Alpha Argo, has long been used by navigators. Apollo astronauts even used Canopus to help guide them on their epic odyssey to the Moon and back. Today, you can undertake your own personal voyage of discovery with the guidance of the Argo Navis™ Digital Telescope Computer.